Key Housing, a short term and corporate housing service servicing Burbank and all of Southern California has announced its March, 2017, featured property. The property is the Avalon Burbank, offering quality corporate rentals in Los Angeles County, California. We are very excited to identify the Avalon Burbank as our featured Southern California short term rental for March, 2017. Key Housing, a leading corporate rental service offering hard-to-find properties for short term rentals throughout California, is proud to announce its featured property for March, 2017. The property is known as "Avalon Burbank," and is located in Burbank, California, in the county of Los Angeles. Each month Key Housing selects new or key properties to alert its readership as they seek hard-to-find corporate rentals in the very tight California short term rental market. The featured short term housing property can be found at 350 S. San Fernando Blvd, in Burbank, California in the "real world." However, Key Housing has an easy-to-use website where potential renters can shop properties in the "virtual world," including the featured property for March, 2017. To view the Avalon Burbank please go to http://www.keyhousing.com/rightside.asp?action=form3&ID=838. Amenities for the property can be found as well as availabilities. To view all corporate housing listings for Burbank go to http://www.keyhousing.com/rightside.asp?location=burbank. Those interested in tips and insights on Burbank short term rentals can also read the company's lively blog at http://blog.keyhousing.com/tag/burbank/. Key Housing’s short term corporate rentals can be found throughout the Burbank area and all of Los Angeles County. Properties may include fully-functioning modern kitchens, on-site laundry and pet accommodations. Top amenities have made the Avalon Burbank property stand out in the crowd, and propelled it to the top as the March, 2017, featured listing for Southern California. Penthouse lofts, hardwood floors and poolside palm trees offer a California experience to visiting employees. Short term housing units can be found at the highly-rated Avalon Burbank. Key Housing, a leading short term housing service has announced the Avalon Burbank as the featured corporate rental for March, 2017, for Southern California. Burbank can conjure images of busy corporate executives ending the day at lush poolside retreats to recharge. Avalon Burbank’s corporate rentals may be the California dream visiting VIP’s desire. 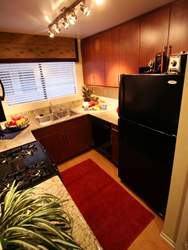 Corporate apartments include in-unit washer and dryers, full modern kitchens and on-trend furnishings. The facilities also include a state-of-the-art gym, pet-friendly and eco-friendly amenities. If temporary housing or interim housing is needed in the Los Angeles County area, Avalon Burbank could be the best choice. Relaxing poolside views during off hours can make short term housing an enjoyable live/work experience. Based in Folsom, California, Key Housing Connections Inc. specializes in corporate housing and corporate housing in large cities like San Francisco, Los Angeles or San Diego as well as smaller cities like Fresno, Burbank, and Carlsbad. Key Housing is a leader in affordable, friendly, short-term and corporate housing in places like Bakersfield, Encinitas, Hermosa Beach, and just about every city in California. Whether it's serviced apartments or a furnished rental, just search, click or call today!